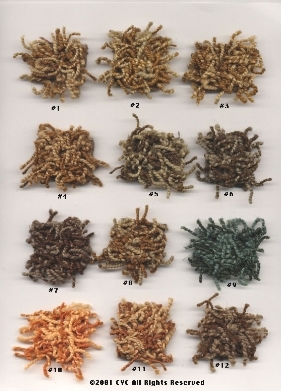 Color Your Carpet® Samples ! 16 Million+ Custom Colors to "DYE" for!!! These photos (below), even on the best monitors and computers, do not do justice to the actual results when seen in person. Send us a sample of your carpet and we will provide actual color samples to you. But remember, only Color Your Carpet® can prove these claims. The large light blue carpet in the center below is the original carpet color. With just a few dozen color possibilities shown here, your imagination and the original carpet color are the only limitations. 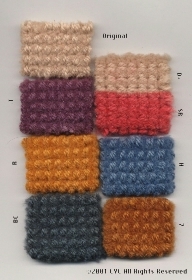 This set of samples demonstrates that Color Your Carpet® does NOT have to dye DARK, even on commercial wool berber! The original factory color on the top of each plate is a very light Beige color, which we dyed to a variety of light shades, medium shades and dark shades. These are only a fraction of the possibilities. This carpet which is installed in a prestigious Chicago high rise office complex is more than 20 years old and was purchased in 1980 at a cost of $90 per yard for the carpet alone! The owner's objective was to change the outdated, impractical light Beige to a more modern and compatible color for the new tenant, a high profile computer and communications company, as an off-site convention facility. 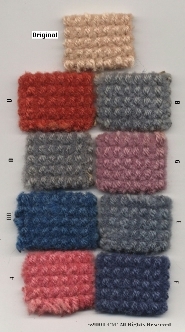 This set of samples demonstrates that Color Your Carpet® can dye multi-color carpets to compatible new colors. The original factory color on the left plate is a variegated Gold and Yellow color, very outdated. But the carpet is almost in new condition after several years of use. We dyed samples to a variety of light shades, medium shades and dark shades. These are only a fraction of the possibilities. The owner's objective was to change the outdated, incompatible Gold and yellow to a more neutral mix of Brown/Beige or a Grey/Light Brown or other more modern and compatible colors for their new decorating scheme. In this set, we changed the carpet from discolored, stained and faded light multi-color Blue to a medium "Royal Blue". A brand new color in the same color family. 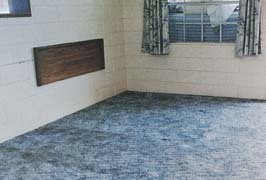 This 120 unit travel motel was facing a $300 to $500 cost per room to replace carpet after only three years of use. We could have restored the carpet without going darker but this motel manager realized his error in purchasing such a light color for a heavy traffic highway location. To read the whole story click here . At less than half the cost of new carpet, we saved this property owner at least $20,000 compared to even the cheapest carpet replacement cost! Sometimes new carpet isn't the best solution to ugly, faded or worn looking carpet. Choose from more than 16 million custom colors. 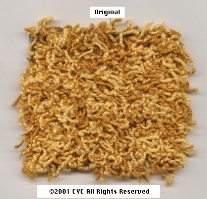 Further, with our exclusive on-site carpet dyeing and color restoration services there are even more benefits! There are no removal fees, no discard fees, no installation fees and far less downtime of your revenue producing property. Carpets can be walked and used right away. As soon as you call, we will arrange for one of our special team of carpet consultants to help you evaluate your carpet dyeing and floor covering options. Find out what the carpet manufacturers, retailers, suppliers, cleaners and even your own corporate headquarters doesn't know or won't tell you about carpet and carpet color care alternatives exlusively from Color Your Carpet® ! Confidential investigative studies, carpet inspections, carpet consulting and educational carpet care programs provided for you and your staff. Our initial consultation is performed on your property at no obligation to you. Color Your Carpet ® is Dyeing to Serve You! Click here to contact an expert carpet dyer near you We want to DYE for YOU!